An anthology collecting stories involving the end of the world and the holidays may well be the strangest concept for a comic book I’ve seen in my many years of reading illustrated fiction. Yet the idea has an odd merit, as one could draw parallels between the mindless hordes of consumers and the desperate masses warring over resources in the face of nuclear Armageddon, as we ponder what is truly important in life. Given that, it’s surprising none of the tales in DC’s Nuclear Winter Special #1 involve Black Friday shopping. In fact, some of them don’t involve the holiday season and some of them don’t really involve the Apocalypse so much as they involve alternate futures and potential endings of different characters’ stories! And while I may be a bit of a Grinch for pointing this out, despite their appearance on the cover neither Harley Quinn nor Wonder Woman have stories in this special book. Thankfully, all arguments over the subject matter aside, DC’s Nuclear Winter Special #1 is no lump of coal. Mark Russell (The Snagglepuss Chronicles) and Mike Norton (Battlepug) handle the frame story for the issue, in which Rip Hunter: Time Master finds himself cornered by cannibal tech geeks in the ruins of Silicon Valley while recharging his time machine. To stall for time, Hunter entertains the cannibals with stories of the many superheroes he’s worked with in his journeys across time and how they survived various end-of-the-world disasters and how those tied into the holiday season. Because it just so happens to be Christmas Day. As with most anthologies, your enjoyment of DC’s Nuclear Winter Special #1 may ultimately come down to how much you like the characters, artists and writers involved. For instance, if you don’t care much for Kamandi, you probably won’t get much enjoyment out of Phil Hester’s story centering around The Last Boy on Earth and how the stories of Hanukkah and Christmas are remembered and honored by the intelligent animals ruling the Earth following The Great Disaster. It’s a darn good story with great art and a worthy tribute to Jack Kirby but it might not be everyone’s cup of tea. It is worth mentioning that Aquaman fans will want to check this issue out, as it features a story that it says will be continued, despite being set in a dark apocalyptic world. Fans of the Injustice series will also want to pick this book up for Tom Taylor’s Supergirl story, which could be seen as an unofficial conclusion to the Earth of that reality. There’s also stories involving Batman 666 (the future version of Damian Wayne who sold his soul to the devil) and the future of DC One Million, though that particular story may be confusing to those who haven’t read the original event. Despite this, most of the stories here can be enjoyed by anyone. Chief among these is “Last Christmas” – a Firestorm story written by Paul Dini with art by Jerry Ordway. Seemingly set in a darker version of the reality of the Justice League Action cartoon, the story pits Ronnie Raymond and Professor Stein against The Nuclear Family in a surprisingly touching story of togetherness and putting aside differences in the name of peace on Earth and goodwill towards all men. And robots. Personally, my favorite story in the bunch is the last – “The Birds of Christmas Past, Present And Future” – and I can think of no reason for this other than it is a Green Arrow story. And not just any Green Arrow but a story involving an old-school, aging-hippie, George Carlin-with-a-bow, Old Man Ollie, who – in this reality – quit the Justice League, broke up with Black Canary and spent most of the last five decades trying to save society while the Justice League degenerated into a bunch of spoiled kids. I won’t say more beyond that, save three things – I want writer Dave Wirlgosz on the monthly Green Arrow book, the artwork by Flash artist Scott Kolins is perfect and you should have Dan Fogelberg’s Same Old Lang Syne on in the background as you read it. 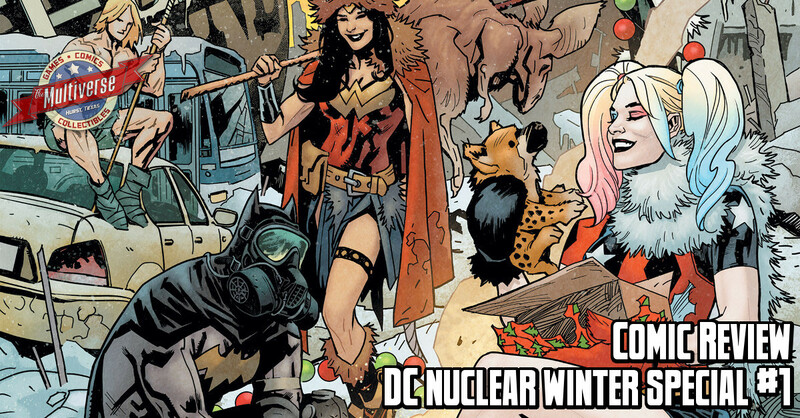 So is DC’s Nuclear Winter Special #1 something you want stuffed in your stocking? On the whole, I’d say yes. Despite not all of its stories fitting its theme, there’s not a dud in the lot. At worst, some of the stories are inaccessible, being based on other books you might not have read. Still, there is far more good than bad here, making this book a wonderful holiday treat. 7/10 DC’s Nuclear Winter Special #1 releases on November 28, 2018!